Today we hear from Tute Genomics on how they're using cloud-based technology and big data tools to support the scientific community and help advance genomics research. Tute has made its 8.5 billion record genetic annotation database publicly available to users of Google Genomics through Google BigQuery. Human genome sequencing is fast becoming standard practice for both clinicians and researchers now that the cost to read all 3 billion letters of a person’s DNA has dropped to just a few thousand dollars. But what does all that information mean for medicine and health? At Tute Genomics we’re answering that question by building a comprehensive database of all known genetic variants and what they mean for disease risk, drug response, and basic research. Because the database contains 9 billion records, it’s been a challenge to work with it on a local computer or servers. That’s why we were excited to discover Google BigQuery. 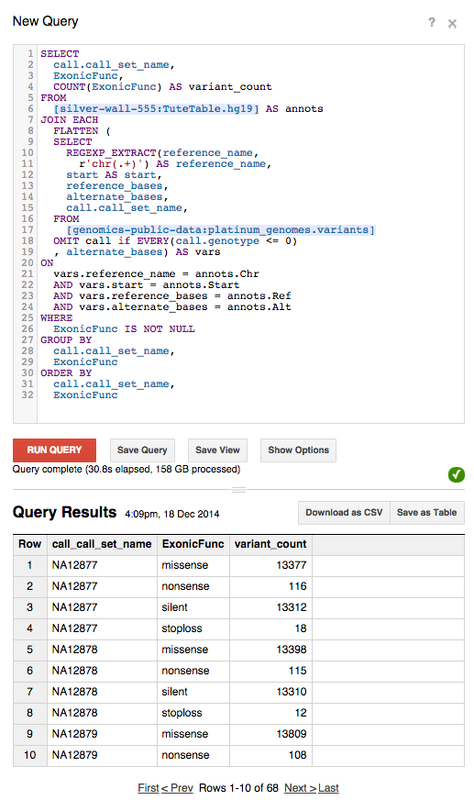 With BigQuery, scientists can run sophisticated queries against the Tute database to link an individual’s genome to the wealth of information about genetic variants in general. The background of information can even include large public datasets like the 1000 Genomes Project, which is already hosted on Google Cloud Platform. With so much data to analyze, data analysis tools like BigQuery are essential. Running queries using standard computers or VMs takes significantly longer. For example, we're able to rapidly count variants from the 17 Platinum Genomes by function. Even with 88GB of input data, we're able to see results in 30 seconds for less than $1, whereas it would have taken many minutes or even hours without BigQuery. Our initial database version includes annotations on 8.5 billion genetic variants. Sources include clinical annotations from ClinVar and GWAS catalog, population frequencies from the 1000 Genomes Project, gene and transcript model annotations – such as amino acid and protein substitutions – and the functional consequence of exonic variants. Additionally, the database includes conservation scores, evolutionary scores, and predictions of whether genetic variants are likely to be associated with Mendelian phenotypes. As genome sequencing becomes a more common part of clinical care as well as basic research, accurate and comprehensive genetic variant databases will be essential to help make sense of genetic information. We find that detailed annotations of genetic variants are a natural match for big data processing with Google BigQuery. We believe in this so strongly that we’ve donated an unprecedented database to the genomics community, made available through Google Cloud Platform. Reach out to us on the Tute Genomics discussion group with any specific questions.